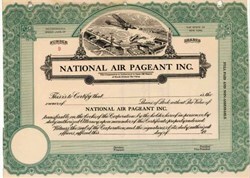 Beautifully engraved unissued certificate #1 from National Air Pageant, Inc. This historic document was printed by the Broun-Green Company and has an ornate border around it with a vignette of a bi plane and mono plane in flight over an airfield. The certificate was in a three ring binder and had two of its borders trimmed. This is the first time we have seen this certificate.